Gastrointestinal bleeding is a common concern encountered in the acute care setting. 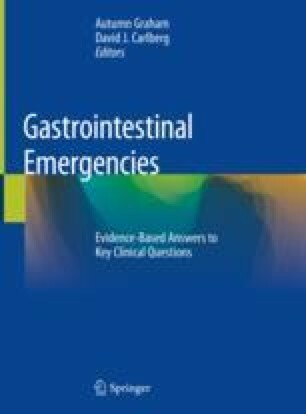 The two determinants for an urgent gastroenterology consultation for a patient with gastrointestinal bleeding are a high suspicion for variceal bleeding and active upper gastrointestinal bleeding. It is important to remember when assessing for an upper versus lower GI bleed that not all hematochezia is from lower GI bleeding and approximately 15% of patients presenting with hematochezia have an upper GI bleeding source. Nasogastric aspiration offers diagnostic information while also clearing blood and clots from the stomach to reduce the likelihood of aspiration and to improve endoscopic visualization. In a hemodynamically stable patient who presents with GI bleeding, transfusion with packed red blood cells should be initiated when the hemoglobin level falls below 7 g/deciliter.